The Handmaid’s Tale bros, a Shatner-esque Captain Kirk, and a pitch-perfect recreation of Where In The World Is Carmen Sandiego— I mean Kellyanne Conway— made Chris Pine’s Saturday Night Live debut one of the show’s finest this season. Pine appeared on SNL over the weekend as a spectacle of singing and dancing, starting with a song set to Billy Joel’s “Uptown Girl” reminding the crowd that he’s not Chris Pratt from Guardians of the Galaxy or Captain America’s Chris Evans (Leslie Jones later shared a selfie calling him Thor, seriously there are way too many dudes named Chris). He’s not the best singer, but he carries himself with so much confidence and enthusiasm, it honestly doesn’t matter. This was later followed with several sketches that seemed tailor-made for modern scifi or fantasy fans. 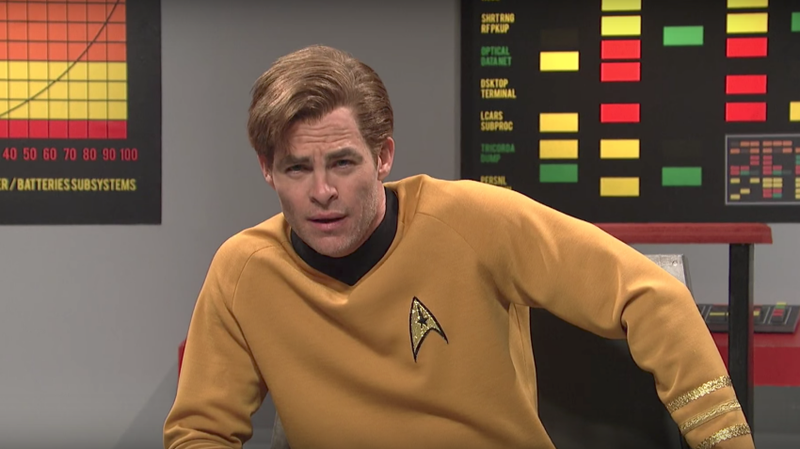 “Star Trek Lost Episode” featured Pine impersonating his Star Trek predecessor, William Shatner, while also dancing to a song about pizza surfing. Also, there was a special shout-out to Kenan Thompson’s Neil deGrasse Tyson, which was bubbling with adorableness. Then, you got SNL’s take on The Handmaid’s Tale, which was surprisingly smarter than I thought it was going to be. I figured it would simply be a joke that Trump’s America is Gilead, but that never came into the picture. It instead mocked men who feign ignorance as women’s rights are taken away because it doesn’t affect them. Could it have been better? Sure, but as is, I liked their take. And finally, there was “Where In The World Is Kellyanne Conway,” which left me in stitches from beginning to end. Sasheer Zamata nailed Lynne Thigpen as The Chief, and the whole thing brought me back to watching the show as a kid. The sets, the acapella, the kids’ stupid intros about meeting lizards. And I love how it ended before things began, with the kids saying they didn’t want to find Kellyanne Conway— because, let’s be honest, who does. I definitely recommend checking out the entire episode, because it was a good one.